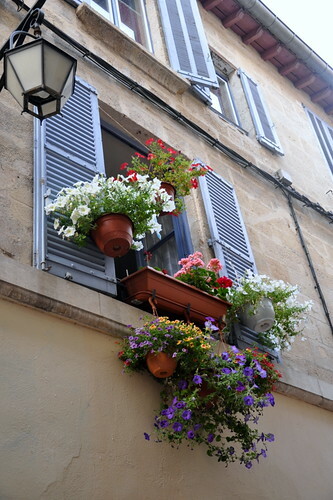 Blue wooden window shutters and pots of hanging flowers--so Provence! 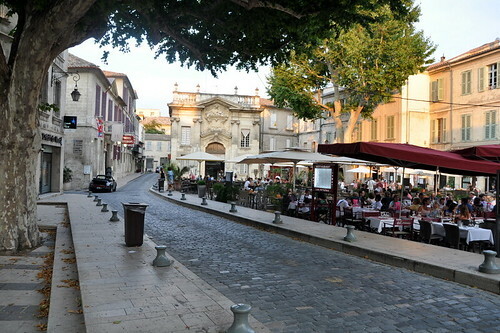 The streets of Avignon are very narrow and I saw a number of cars rub their bumpers as they took the corners. 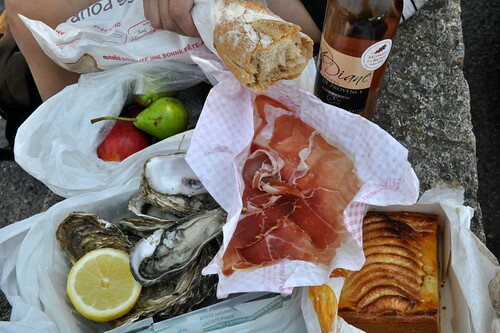 We couldn't find any parks to eat our lunch of prosciutto, oysters, baguette, apple tart, fruits and a beautiful rose wine (which kept us drunk all the way to Arles) so we sat on a bench outside the city wall. 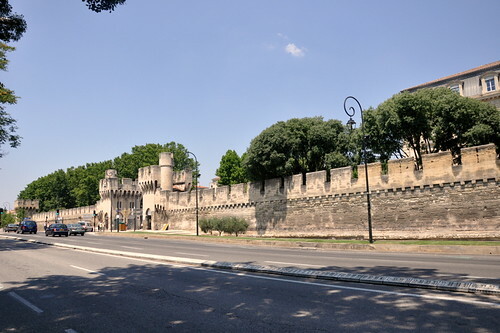 Avignon, like many little French towns, has a fort-like wall around its old town. While in Barcelona, I agonised over whether to spend more time in Spain and do the Andalucia region, covering Seville, Granada and Cordoba, or whether to move on so that I could have more time for Italy. In the end, I decided to leave Andalucia for another time when I can focus on Spain, including the Basque region. It's always nice to dream. Since language was a problem and we were not with a tour group, it was both worrying and fun to plan our holidays. Should we fly or should we take the train or the bus? We decided to go with the bus. The Eurolines website has an English version but to buy the tickets, you'll have to revert back to Spanish so in the end we had to buy the tickets at the bus station. The bus ride from Barcelona to Avignon in France was to take 6 hours but the bus stopped in many small cities and pit stops, including a border check in which a passenger was booted out by the French immigration, and we had a strange situation whereby a passenger asked to be let off at "La Guell" in city/town called Nimes and the bus driver drove for 45 minutes looking for the street so that we reached Avignon at 6 PM, a 9-hour journey! I just couldn't believe that the Eurolines driver would be so unprofessional, holding the whole busload of us back just for one passenger. It was strange that people who were getting off at Nimes didn't complain until much later. Europeans are very tolerant it seems. In Italy, people just cut into queues--eyeballing you-- like it was their right I was pleased when in France a guy complained to the bus driver openly because a gothic-looking girl was smoking weed. I think Europeans should speak up more. Doesn't 'Avignon' sound so French? I had no idea what was in Avignon and went there because it was near Arles. I imagined a very nice French town and was I disappointed. Avignon's bus station had the dirtiest toilet of all the toilets I had been to. I was about to enter the toilet when a French girl told and gestured to me that it was too dirty. I saw flies milling around the bowl and ran out, withholding my breath. I can forgive dirty toilets in 3rd world countries but in France? Small town France is no better than small town Malaysia. There's nothing much in Avignon. The only tourist spot in Avignon is an unspectacular church and the unspectacular gardens around it with a view of the Rhine River and the vineyards along it. The restaurant scene was quite busy though, with lots of tourists dining on the cobblestone streets. There are more Asian tourists in Avignon, especially the Japanese and Chinese, than the other places I'd been. Tourists vist Avignon on the way to Sault, a town famous for lavender fields. You must've seen those beautiful lavender fields of Provence in L'Occitance ads. Since it was high tourists season, the tours were full and we had to decide between staying another day in Avignon to see the lavender fields or to move on as planned to Arles. Yi made a good decision for us: no lavender fields. We saved 80 euros because I later met a tourist who said that only a small portion of the lavender fiields were in full bloom. I'd rather see the lavender fields in Hokkaido one day anyway, since I imagine that Hokkaido won't be as searingly hot as southern France. 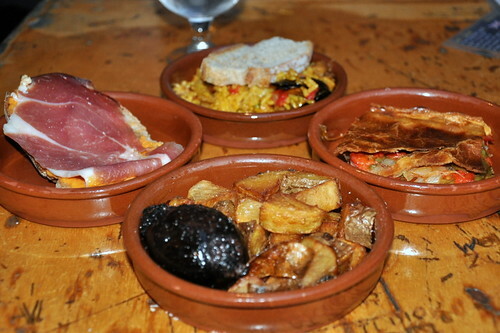 We walked around a long time, not sure what to eat and finally, exhausted, we decided to have a light dinner of tapas. The southern parts of France seemed very Spanish-influenced, with lots of paella and tapas restaurants. The paella was no where as good as the one we ate in Barcelona, the blood sausage was okay but not something I'd long to eat again. The jamon on baguette was of course delicious and the veg empanada was good too. 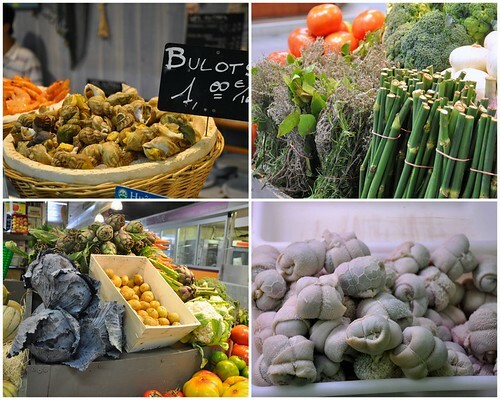 Snails, some kind of stems and herbs, cabbages that are nearly black in color and little bundles of tripe. 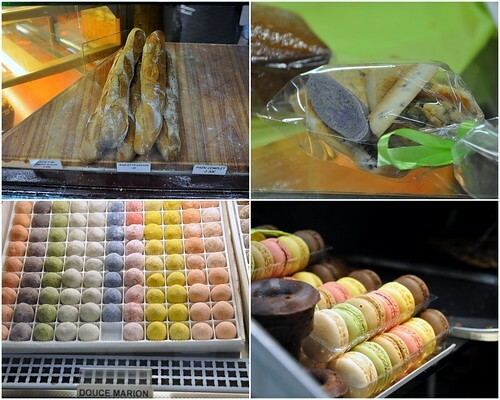 At an indoor market, we bought a baguette for 1 euro, an assortment of sables of all flavors, including lavander (nothing to rave about), mochi-looking 'marion' which I found rather strange-tasting and macarons which I didn't try. 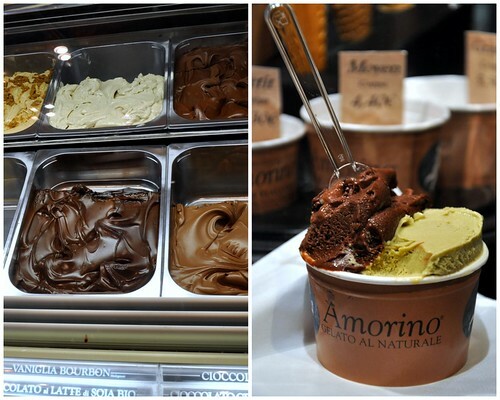 This is the richest ice cream (look at the color and texture of the chocolate ice creams) we've tried in all of Europe. It was also one of the most expensive. A medium cup or a cone was 4.40 euros while in other places, medium gelati cones were about 2 euros. Yi and I ate gelati everyday and our favorite is in Trastevere, Rome and Amorino's, which is everywhere. From Avignon to Arles is an hour by bus, 21.20 euros for two persons return. I would suggest that if lavender fields are not your thing, skip Avignon and go straight to Arles. Eurolines buses that go to Italy actually pass by Arles, so make Arles your stop. We were told the bus doesn't stop there and so we left our bags in the locker at Avignon, spent a day and night in Arles and went back to Avignon to pick up our bags and to leave for Italy, to find that the bus went back to Arles so it was a waste of time and money. What I'd do, if I ever go to Provence again, is to hire a car because transportation between the small towns in Provence is limited and unreliable. p.s. Some of you asked if I'm still in Europe. I got home on 19 July and was fine until last week. Nobody warned me that living--and leaving--Europe can give you post-Europe blues but here I am, bored and missing baguette sandwiches (and I was sick of them when I was there). Although I was away for 2 1/2 months, I didn't miss the food back home. Now I go to the supermarkets and push my trolley round and round, unable to find anything to cook a decent meal. I find veggies especially lacking here, if I had to cook western. I was lucky to grab the last box of arborio rice for my paella (no bomba rice here) and parmesan reggiano is an obscene RM179/43 euros per kg while in Italy, you can buy good parmesan for 8-12 euros per kg. I know I complained that Europe was expensive but for the same things here, we have to pay much more for stale, low grade stuff. welcome home, Terri. I bet you must be happy to be sleeping in your own bed for a change. 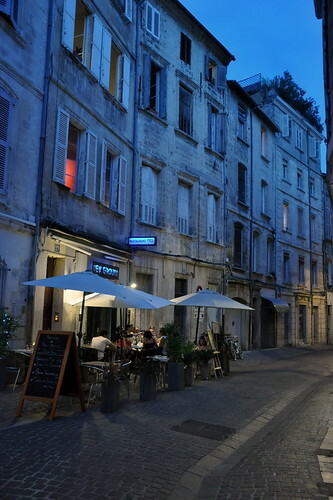 I've actually been to Avignon twice and both times, I had a great time. I'm sorry to hear that the town didn't live up to your expectations. Aix is a lot more beautiful though albeit smaller. The best thing about living in the UK is the access to ingredients not available in NZ or Asia. ccc: i am, esp since we're getting lots of rain. i love the wind blowing into my room bc i sleep w/o aircon, just so wonderful. aix was one of the stops but we didn't get off the bus. i think it's better to travel in a car for these towns so you can stop anytime anywhere. yes, i feel it so much now, the lack of ingredients. nz and even aus r quite limited compared to continental europe n even london surprisingly doesn't have much italian or spanish stuff altho u can still get them if you search but still, just a couple of hours away n the food's so different. heather: the toilet charge in avignon's train station was 50 euro cents n there was no water!*&"*! How does blood sausages taste? Like the curdled pig's blood? Oh, I remember Avignon where we took a bus to Provence. Small place, nothing much to do. But you should have tried the macarons. The small town ones are the best.